Nor would I want to lug a 100-pound Super Reverb on NYC subways for gigs. But as a working musician playing 2-3 gigs a week, they all can't be elaborate, expensive productions... sometimes it's all about setting up as quickly as possible in the corner of a bar (and hoping none of your equipment grows legs during breaks). Along with my favorite strat, Leia (a Fender 60s Road Worn model, heavily customized with Arcane '61 pickups and a Callaham vintage bridge), my amp for situations like this is a Fender Princeton Reverb reissue, upgraded with JJ 6V6 tubes and a Celestion G10 Vintage speaker in place of the stock Jensen. Both of these upgrades improve the clean headroom and overall tone of the amp tremendously, as the tubes that Fender uses these days are cheap Chinese-made imitations, and the newer Jensen speakers sound good at low levels but can't handle much power without getting flubby in the bass and breaking up harshly. The G10 gives me greater power handling, increased perceived loudness due to higher dB sensitivity (more on this in a future column), and retains the classic Fender sound while adding a bit of British midrange push, the best of both worlds for me! and a few New Orleans stickers (my second home). I also keep a Sennheiser 609 microphone in my gig bag, which has a flat profile and can be hung from the amp handle right in front of the speaker. This setup allows me to cover just about any situation with a decent PA system without pushing the amp too hard, and provides a great clean platform to stack pedals into. It's also nice to have a great spring reverb and tremolo available without taking up any pedalboard real estate. Although Stevie loved his clean headroom, he also loved the rich harmonic juice of cranked tubes. 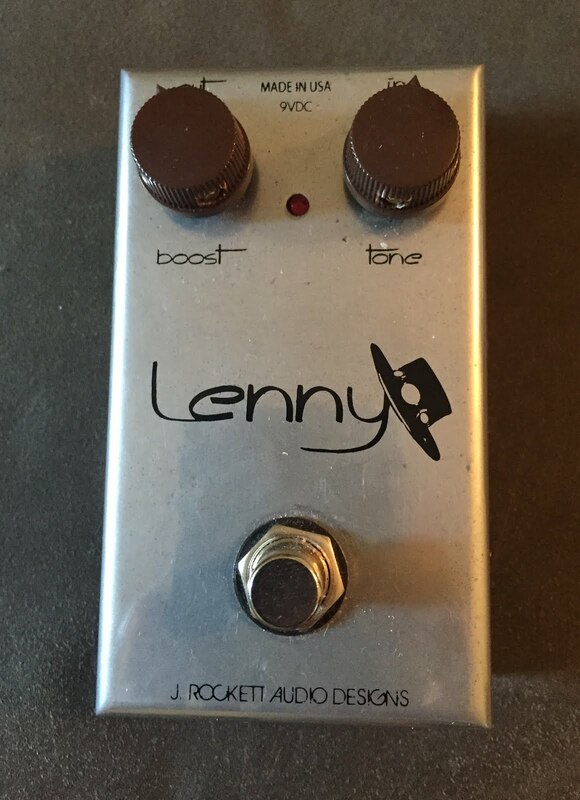 My favorite way to simulate this is with a great new pedal from J.Rockett Audio Designs, called, not coincidentally, the "Lenny". It was an attempt to simulate the tone of a pushed Dumble Steel String Singer, and they nailed it in spades (although SRV actually used a Dumbleland Special for the song "Lenny", we'll look past that). Put in front of a clean amp like the Princeton or any blackface Fender, it adds beautiful harmonic midrange content, plus it tightens up the bottom end, and the tone control can be used to push the high end for a little extra cut. You can also use it to boost an amp into natural overdrive, too, but I prefer it for clean color (I believe it's very similar to the FET input stage that most Dumble amps feature, but this isn't confirmed). Before this pedal was available, I used another J.Rockett model, the "Archer" Klon clone, set for a clean boost, but Lenny does this job a little bit better for my needs, and the Archer has other great uses that we'll cover in the future. 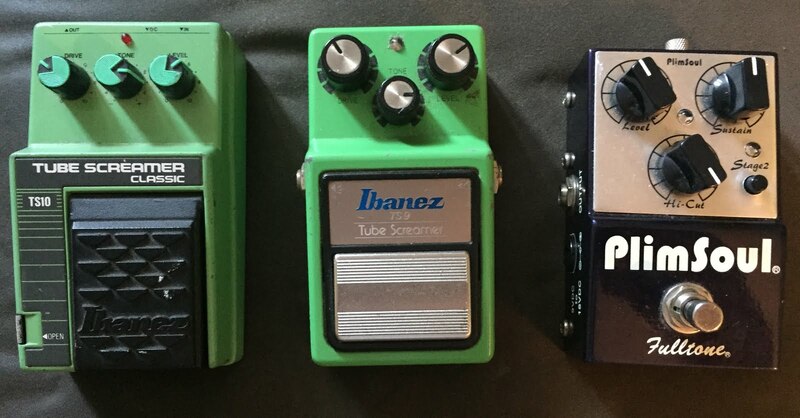 Those two pedals will get you pretty far, but adding a few others will be even more fun... gotta have a good wah pedal for "Voodoo Child", right?? I've got a great-sounding Vox, but it's heavy and takes up lots of pedalboard space....the new Crybaby Mini by Dunlop sounds excellent, especially in "vintage" mode (internal switch), and as long as your shoes aren't too heavy, the feel is just fine (don't try it with cowboy boots). It also fits nicely on a Pedaltrain Nano. 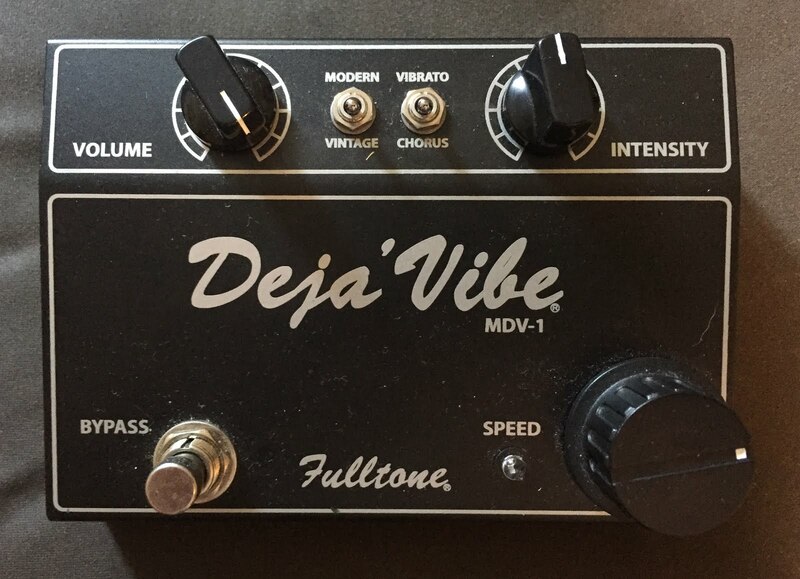 Next up in the "mandatory' category is a good vibe pedal... mine is a Fulltone Mini Deja'Vibe, which i leave set to "vintage" and 'chorus" modes. I'll use this for tunes like "Cold Shot" and "Couldn't Stand the Weather" in place of a Vibratone cab, and also for Hendrix tunes like "Machine Gun", "Freedom", and "Hey Baby" instead of a UniVibe. I've included a brief demo just to show the settings I use for these tones, as it is capable of much more than just that. 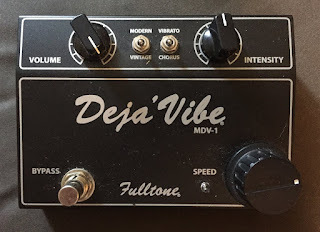 Now, if you really wanted to push the "SRV-meets-Jimi" thing even further, you'll need a good Fuzz Face clone, as well as an Octavia-type effect. 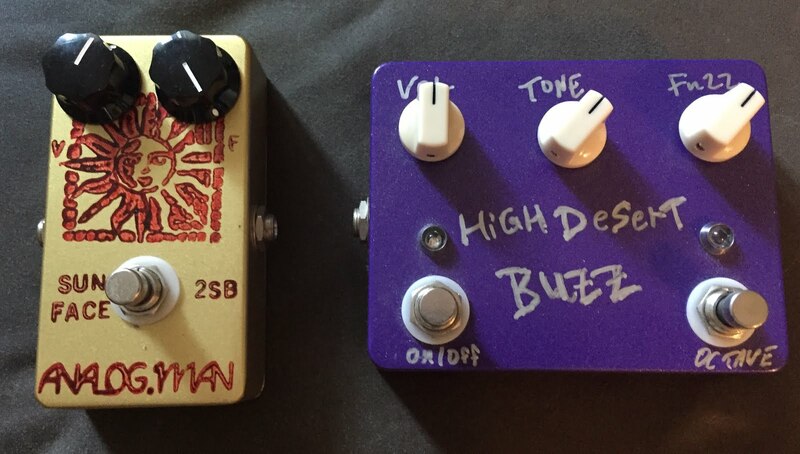 For a while, I was using a homemade pedal for both of these, although it's a silicon-based fuzz, not germanium. I call it the "High Desert Buzz" (after a very mind-expanding trip I took to Joshua Tree, CA), and the upper-octave overtone effect can be switched on and off separately from the fuzz. It can be a bit over-the-top for vintage tones, but perfect for Billy Gibbons/Gary Clark, Jr/Josh Homme-type sounds (I'll demo this pedal in a future blog). There's also the great Analogman Sun Face germanium fuzz, which is a less intense, smoother-sounding fuzz, and likely closer to the Diaz Square Fuzzes that SRV used. 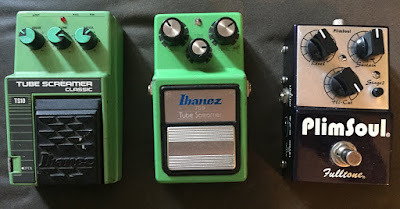 If pedalboard space allows, i'll place the Sun Face or Desert Buzz first, as most fuzzes prefer to see the guitar's high impedance output directly, and kick it on for the occasional solo. Well, there you have it. I certainly prefer my strat for SRV material, but honestly, it's way more about how you play it than what you're playing. Learning to nail that Texas shuffle feel is more important than any guitar, amp, or pedal. I've seen guys absolutely CRUSH "Pride & Joy" on a Les Paul, and occasionally i'll play it on a Tele when filling in with my friend J.D. Patch's outlaw country group, the Hell Dwellers. 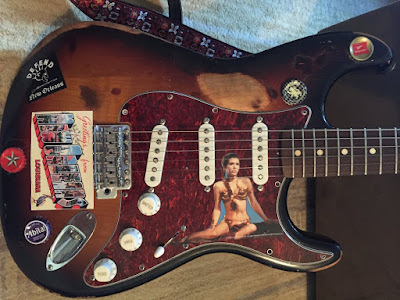 But if you ever have a chance to check out my band, J.P. & the Voodoo Blues, it'll be with the great gear you've read about here, and maybe a '64 Vibroverb someday. Oh wow, this is the coolest guitar site that i've ever seen. I'm gonna share this with my brother, and im sure he's gonna love this as he's a musician and a sound engineer himself. Great work guys, keep it up!